PHOTO BY ZACH BAKER Calvert’s Austin Jones (center) signs a letter of intent Thursday to play football at Tiffin University. Joining him are, from left, his sister Ashlyn, his father Jimmy, his mother Kristi and Senecas’ coach Steve Reser. For the last two seasons, Calvert tailback Austin Jones used the field at Frost-Kalnow Stadium as his personal playground. He humbled defenses and helped push the Senecas to back-to-back playoff appearances. Some things figure to change when Jones embarks on his collegiate career. But the field — and the city — will stay the same. 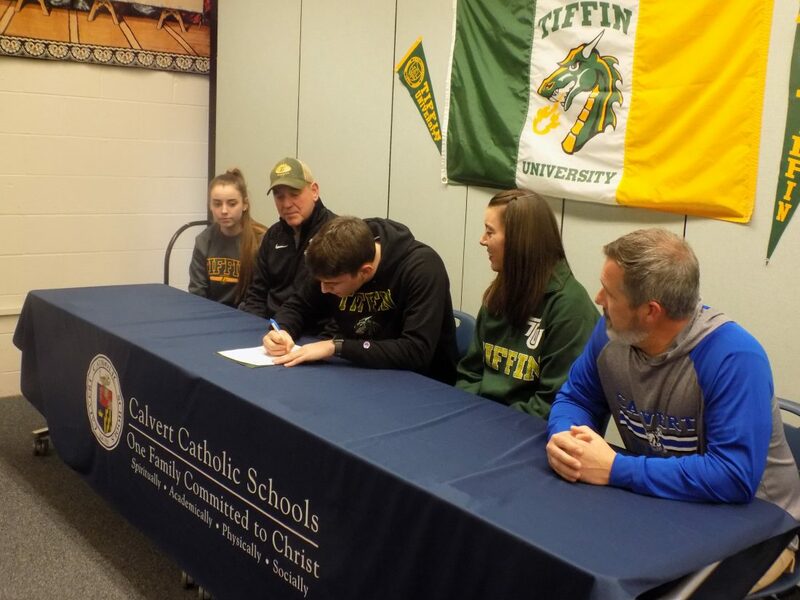 Jones signed a letter of intent Thursday to play football at Tiffin University. He’s one of 22 players who signed with TU this week, and the only tailback in the class. Jones said remaining in town appealed to him. The Dragons are coming off three consecutive winning seasons. Tiffin University’s interim coach, Seth Duerr, said Jones impressed the TU staff. But Duerr said their were other reasons TU liked Jones. Jones emerged for Calvert in the 2017 season, when the junior averaged nearly nine yards a carry, scored 29 touchdowns, and came up just shy of 2,000 yards. Jones was a first-team all-Ohio selection that year. It was after the 2017 season that then-Calvert coach Todd Fox resigned, and was replaced by Steve Reser. Jones again excelled in ’18. The 6-foot-2, 195 pounder was a second team all-Ohio choice, rushing for 1,367 yards and 20 touchdowns. He also had 143 yards receiving and caught a TD pass. Jones said he hopes he can make a quick contribution to the Dragons. Jones was asked what he hopes to get out of the college football experience.